I present a labor-of-love. It is a project that I have been working on for a while. It is part-theme and part-playlist. 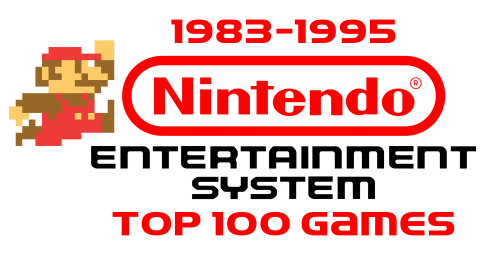 Basically, it's a historical look through Nintendo's console history with playlists designed to capture the best of every release (in 20, 50, and 100 game lists). Included in the zip file are customized clear logos, XML playlist files, and downloaded Youtube commercials. The Best of Nintendo - Please check out the video and let me know what you think. Notes: *I started by aggregating data into spreadsheets for each console. Based upon review scores, polls, and web lists, I created my own lists of the best, most important, successful, or under-appreciated games for each console. Spreadsheets with sources here. Best of Nintendo Home Consoles Best of Handheld Consoles If you feel these lists are criminally incorrect, please let me know. *I created clear logos for each playlist. I used a variety of sources from the web and the clear logo collection in the Unified theme pack as starting resources. I haven't used Photoshop in quite a while, but it was fun getting back into it. If you have any requests or suggestions regarding the logos, please let me know. *Then I scoured Youtube seeking interesting and funny commercials for each platform. Clearly, I could not find many of them in high quality. For many videos, I had to edit out intros or outros. Apologies to original uploaders for not giving proper credit. If anyone has suggestions or higher quality versions of these commercials, please let me know. *Grabbed general console information from Wikipedia - slight editing. 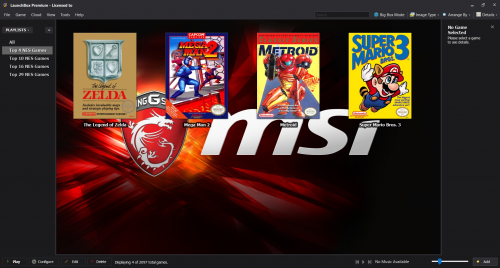 *Used a combination of the excellent Unified theme, Coverbox theme, Famicom theme , and BG Clean theme for the game lists. *Obviously Game & Watch is not a real top 10 - I'm still waiting on Mame to start emulating some of the more popular releases. *Nintendo 3DS and Wii U are limited to top 20 for now. Also waiting for emulation to catch up with these newer platforms. *Big thanks to Colpipes78 for the great set-ups, implementing Rocket Launcher, media, roms, and making my life (and many others) a thousand times easier. I hope some of you find parts of it useful. Next - Sega or Sony? I recently set up Pcsx2 in Launch Box and it is working beautifully. I used the tutorial titled "LaunchBox Tutorials - Emulating PS2 with PCSX2" on YouTube to get it all set up. Great video but I have encountered one wired issue so far. When I launched a game of devil my cry I got this strange video effect where parts of the video overlap itself (See Pictures below) Also this doesn't happen during the first pre-rendered cut scene or in the menus only in the game engine stuff it would seem. I have no idea what is happening or how to fix it so any help would be welcome. and thank you in advance. The definitive top NES games. Included is four files so you can use whichever works for you: Top 4, 10, 16, and 29. If you want best 65, there's another file on the forum by Jason Carr. I'd recommend the top 4 or top 10 All the top games lists seem opinionated so I decided to make a list that would just be the games most people agree belong on such a list without anyone's personal idiosyncrasies (If this was my personal list you'd see Solar Jetman, but that's a niche game). In case anyone cares, this was my process. First I looked through 14 Top nes lists, and made a list of games that were in most of them. I then gave them point values based on how many lists they were in and how high in those lists, and deleted those with low scores. Next, I compared each of the games to each other (looking at each list that two games are in and seeing which is higher than the other the majority of the time). I then ordered them based on that and deleted the bottom ones (sorry Duck Hunt, you're always at the bottom of the list). At this point, I had 29 games and decided to go with that number rather than delete four games just for the sake of having a round number (though I'm not sure that the bottom three games belong, they sort of teetered on the edge of being included or dropped). I split them into groups based on where there was a decent drop from one game to the next, though this was much more apparent in tier 1->2->3 than 3->4. Here's the list if you want to see it before downloading the xml: Tier 1: 1 Super Mario Bros. 3 2 The Legend of Zelda 3 Mega Man 2 4 Metroid Tier 2: 5 Super Mario Bros. 6 Castlevania III: Dracula's Curse 7 Bionic Commando 8 Contra 9 (Mike Tyson's) Punch-Out!! 10 Final Fantasy Tier 3: 11 Super Mario Bros. 2 12 Kirby's Adventure 13 Tetris (preferably tengen) 14 River City Ransom 15 Crystalis 16 Ninja Gaiden Tier 4: 17 Zelda II: The Adventure of Link 18 Castlevania 19 Mega Man 3 20 Bubble Bobble 21 Blaster Master 22 Tecmo Super Bowl 23 Dragon Warrior III 24 DuckTales 25 Excitebike 26 Kid Icarus Tier 4.5 27 Metal Gear 28 R.C. Pro-Am 29 Dragon Warrior Notes: Although you'd think that this method would miss out on games in a series thanks to different lists having different entries, I found that this was not the case. Even pooling games from a series that no single entry made it did not make any series make it. At best you got something like Duck Hunt, a game at the bottom of every list. That being said, I did pool the nintendo version of tetris with the tengen version. Most lists had only one, but no list specified nintendo over tengen and some did vice versa, so I counted nintendo tetris as tengen tetris (except for one list that had both) Personal note, do not play the gba version of Super Mario Bros 3. Play either the NES or SNES version. The GBA version might have some extra features, but restarting from the level rather than the world ruins the game Also, although it's on the list, don't play the nes version of Metal Gear. Play either the msx2 version or the slightly updated port included in the ps2 Metal Gear Solid 3 Subsistence disk 2 and the xbox 360, ps3, and psvita Metal Gear Solid 3 HD edition That's all, enjoy!